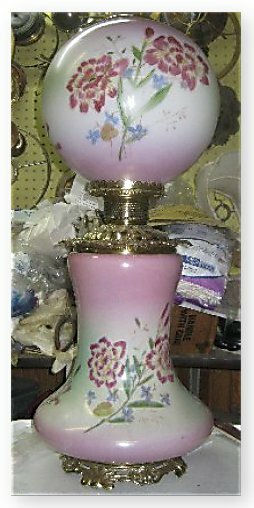 The act of getting a Victorian Era lamp back working the way it was designed to is cathartic - an act of mercy for the lamp and good for the soul. These lamps were works of art. They survived for over a century because of their beauty, even though no wicks were available for decades until I had them custom made a few years ago. 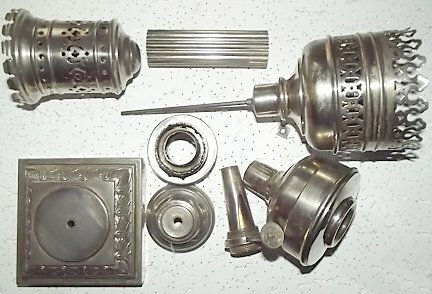 Restoration can be as simple as cleaning and polishing or as troublesome as removing dents, replacing broken chimney fingers and patching holes in founts - or having the original nickel plating replaced. 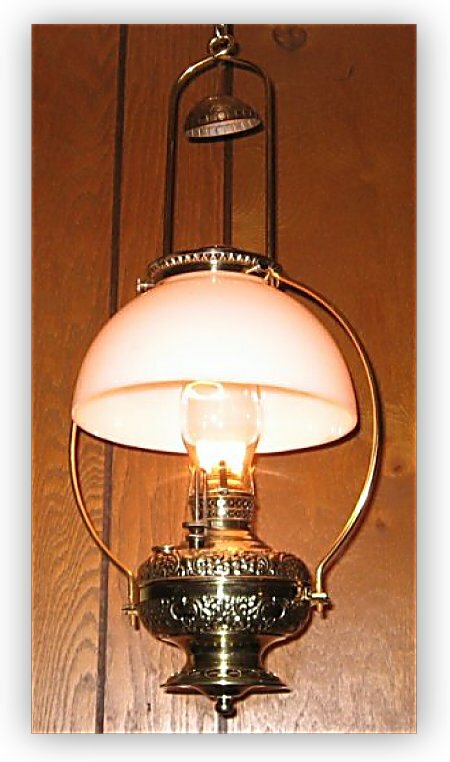 And now, shades can be made to match the base of many Victorian Era lamps. My newest restoration, and the best by far. At left is a huge P&A Royal GWTW lamp I purchased years ago on eBay. From the base to the top of the chimney it is 29" tall. 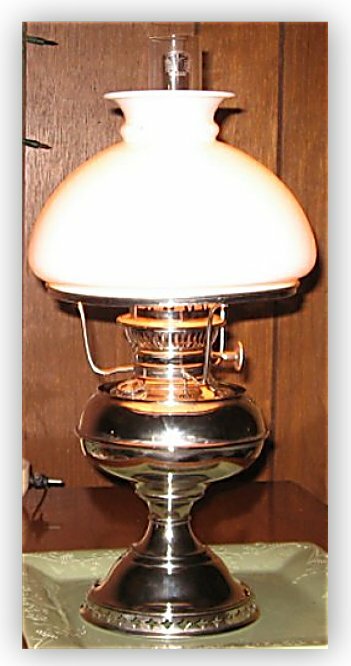 The original globe shade had been broken decades ago, so I put on a fairly pretty shade but it obviously did not match the lamp base. At right is the lamp as restored by David Ward of The Village Lamp Shop. 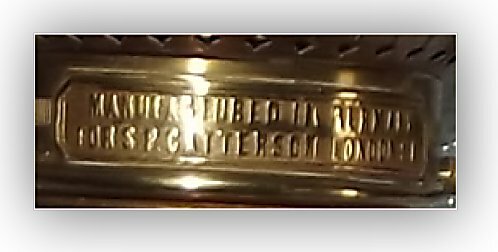 The brass is polished, the crown ring and base were brass plated and polished. The beautiful ball shade painted by Marsha at the Village Lamp Shop to match the base! Contact information is below. Many "Gone With The Wind" (GWTW) lamps had their shades broken in the past 120 years. Without a matching shade these lamps simply lose their luster, their nostalgia - and a considerable amount of their value. Marsha of the Village Lamp Shop has been painting shades to match the base since 1989, and her shades restore GWTW lamps to their original beauty. Please note that no one ever accused me of being a good photographer. The setting, background, light from the flash, etc, will alter the apparent colors. In the photo above right, for example, the ball shade reflected more light and therefore appears to show more white in the middle of the shade than is really present - the shade does exactly match the colors and tone of the base in real life. The color in the base above left was taken with a different camera in a darker room. 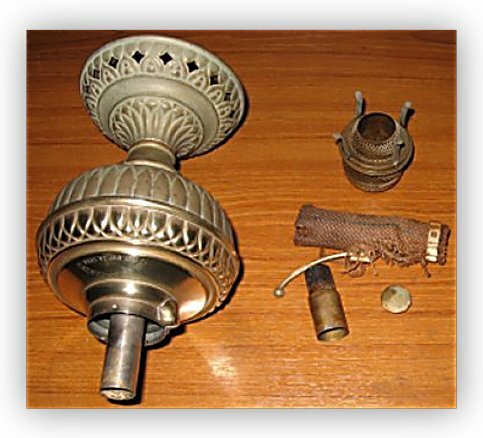 Let us look at other lamp restorations, beginning with the smallest size. 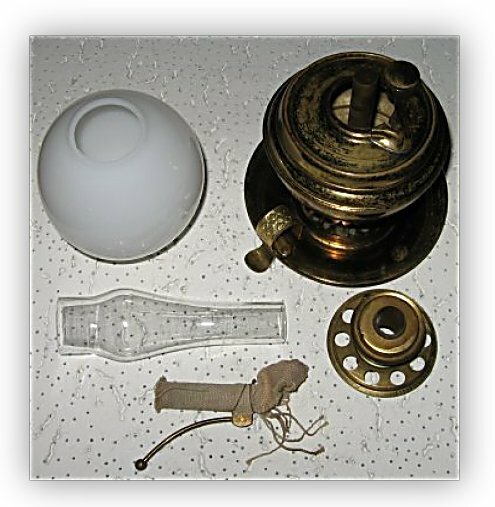 The "Tiny," "Little" or "Junior" lamps were usually used in wall brackets, but a few were sold as hanging lamps and the hangers or harps themselves are virtually impossible to find. Dave Ward of The Village Lamp Shop made the harps shown below for me based on illustrations from period catalogs. 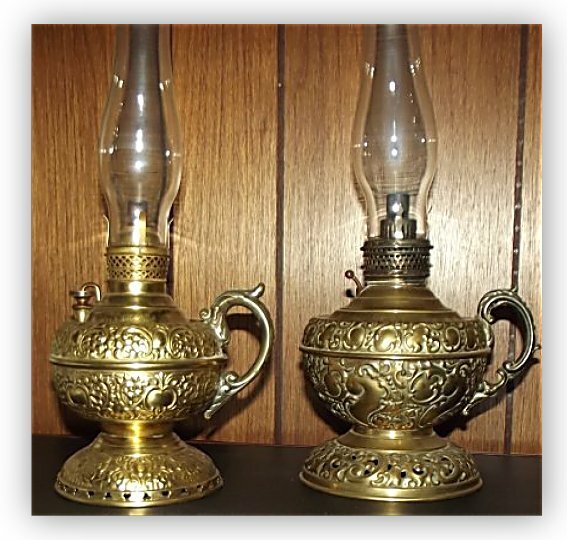 The lamp on the left is a Little Jewel, made by Ansonia in the 1890's. Dave Ward made the very detailed and beautiful hanger, then plated everything in rose gold. 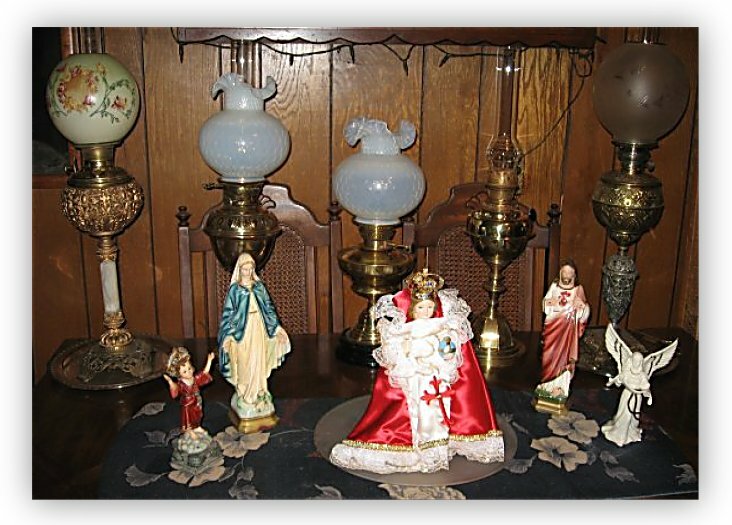 The lamp on the right is an embossed Tiny Miller, also from the 1890's. The shape and style of the harp and shade were miniaturized from the style used for the Miller Dresden hanging lamp. Dave made everything you see except the lamp and chimney, which means he even cut the shade to the right shape. Then he plated the metal in brass. Both of these hanging lamps are incredible jewels! 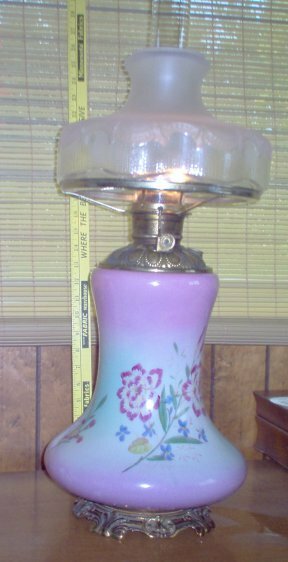 The Jr. Rochester Table Lamp, size 0. Patent Sept. 14, 1886. This is perhaps the smallest table lamp manufactured. 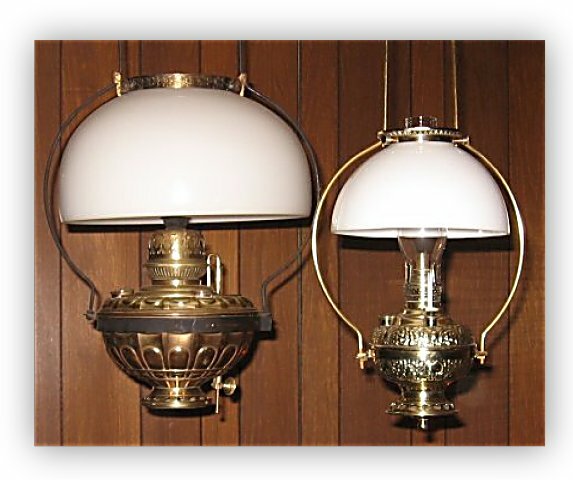 These lamps were used in the summer for lighting when the heat generated by a larger lamp was not desired. At left, the lamp as I received it. A layer of corrosion and dirt, but overall it was in fine shape. 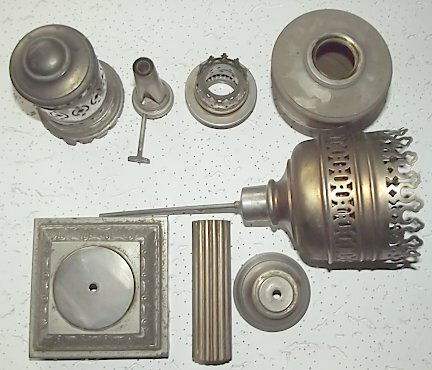 At right is a photo of the lamp after boiling, disassembly, cleaning and polishing. This one was easy to restore to working condition. Circa 1894, dated by wick raiser system. 14''' Central Vulcan. Made by Wild & Wessel for Catterson in London. Pre-1900. It is almost twice the size and triple the weight of the Little B&H at right, but both used the size 0 wick and produced the same light output. See Globe Vulcan Wick Knob indicia and Catterson plate on the burner, and outer draft tube indicating this is a 14''' Central Vulcan. 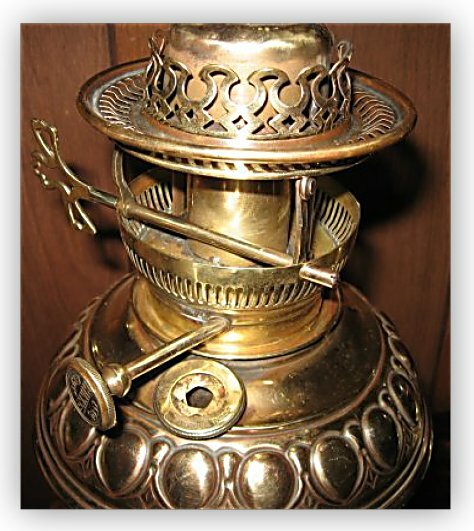 These lamps used a wick which was circular but had two long tails and was fed through the top of the burner. 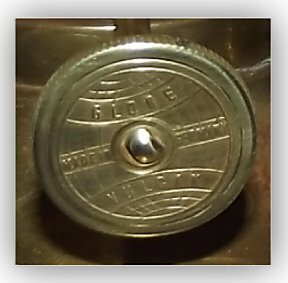 Note that while the wick winder says "Globe Vulcan" it is unlike other Globe Vulcan's as it has an Agri-Brenner flame spreader and gallery mated to a 14''' Central Vulkan draft tube and wick raiser assembly and uses a Central Vulcan wick. 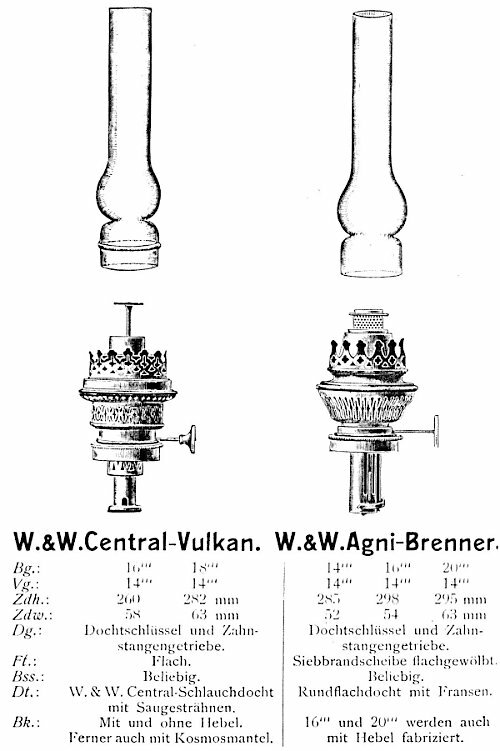 Both the Central-Vulkan and Agni-Brenner are shown side-by-side in the 1906 Goldberg catalog, listed under Hugo Schneider Aktiengellschaft, Leipzig, as H.S. purchased Wild & Wessel in 1903, and may have been assembled by H.S. and sold to Catterson in this form. It should have a 14''' Vulcan chimney. These were easy ones to restore, needing only cleaning and polishing. <<< Miller Jr. Hand Lamp on left, Tiny Juno Hand Lamp on right. >>>> L to R, Parker, Hinks, Veritas, Young's Court, B&H Imperial. 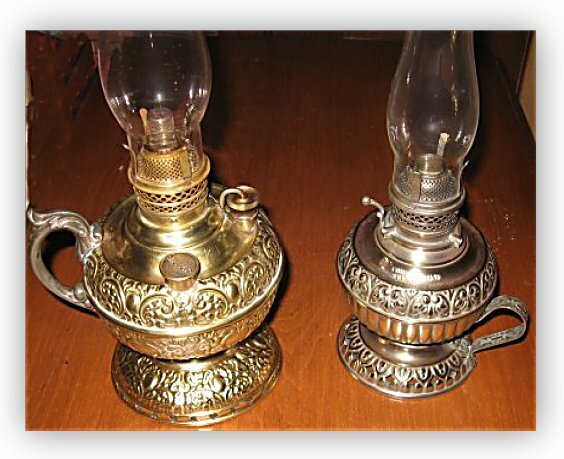 These lamps needed only cleaning and polishing to bring out their beauty. Some lamps are difficult to polish, but the results are worth the effort. Shown left and right is a Hinks 45 CP Annular. 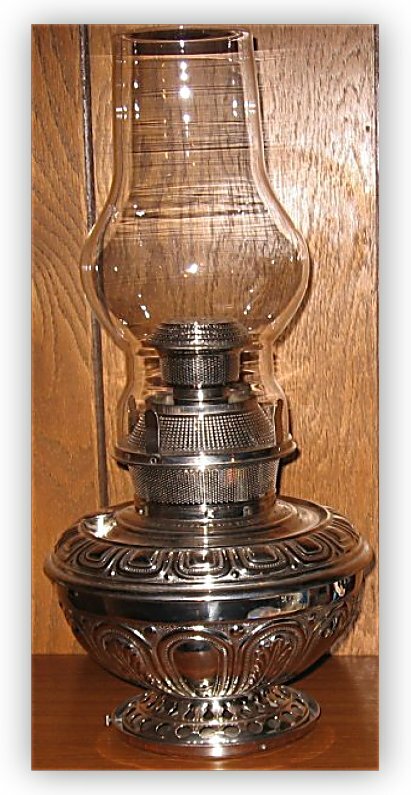 This Hinks Annular 45cp has that unique feature of Hinks lamps - the Morton's patent iris fill cap, and a key lift gallery - the lamp can be lighted without removing the chimney and shade. 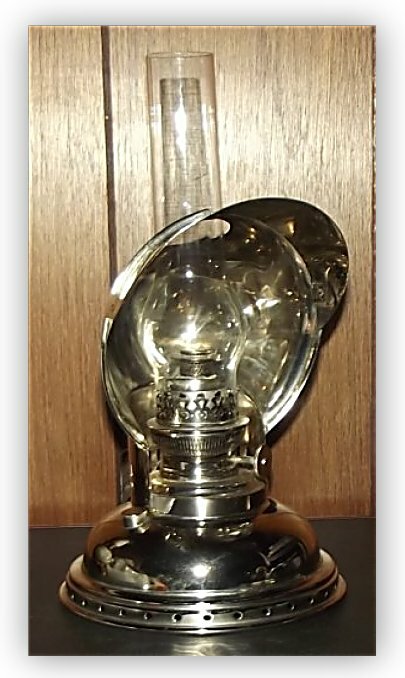 The complexity of all the small parts means a lot of Q-Tips, Blue Magic Metal Polish, liquid auto polish, and considerable patience can end with beautiful polished brass lamp. 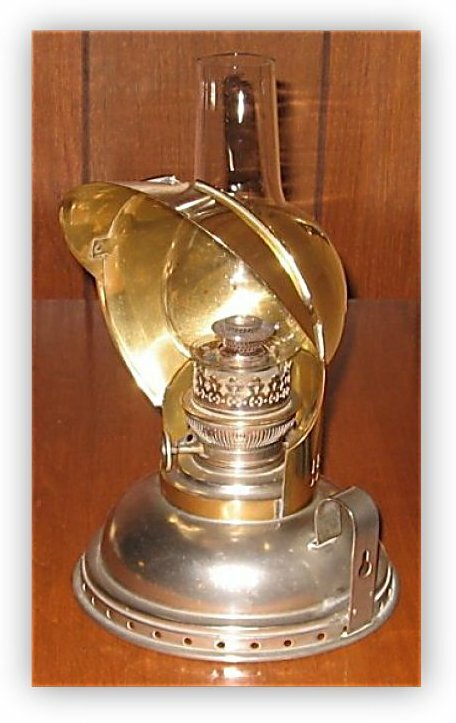 The Baby Rochester is most likely the smallest center draft lamp ever made. The wick would have to be labeled a "1/2 - 0" because it is only 1/2" diameter. This version with the tiny ball shade is the only one I have seen. This lamp had a copper wash finish which was peeled and fading - very ugly. I polished off the copper wash, boiled out the fount, and the result is the beautiful lamp shown in the right side photo. Replated lamps. 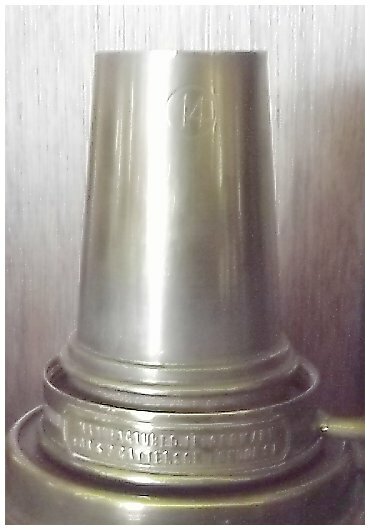 The next series of photos shows lamps which were originally nickel plated but the nickel had tarnished or was simply worn through. Restored and replated by Dave Ward. It came out so beautiful it is on the front page of his web site. Both of these lamps were restored and replated by Dave Ward of The Village Lamp Shop. David no longer does replating work. This Radiant #4 is the early version with the post-type flame spreader, and about as close a copy of the 20''' Belgian as B&H could go without patent infringement. 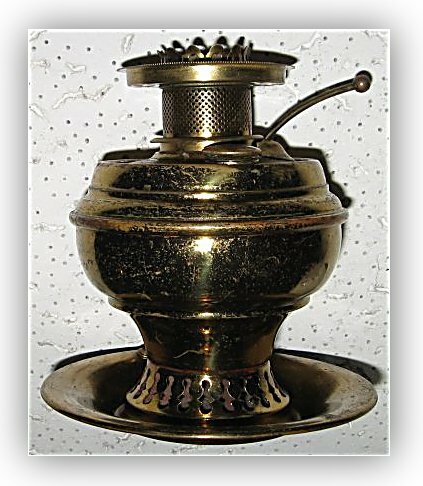 Later versions had a thimble-type flame spreader. Rayo Jr. on left. Plating by Dave Ward. Rochester store lamps on right. Dave Ward replated the 2nd model Rochester Store Lamp (1886) on the left side of the photo. On the right is a 1st Model (1884) with original nickel that I cleaned and polished. 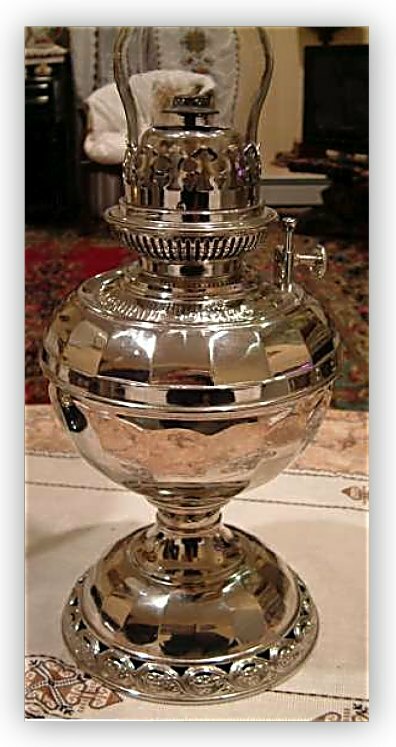 Hugo Schneider lamps were made from steel, not brass, and as a table lamp with an insert fount! This is reported to be the last "Blitz" table lamp left in the world. My Schneider was fabulously restored and has a new nickel plating by David Ward of The Village Lamp Shop. David no longer does replating work. Left, P&A Royal #2 Table Lamp. This embossed P&A Royal is a very nice lamp. Right, L&B Belgian 20''' Table Lamp. A rare embossed Belgian in perfect condition. Veritas "The Reader" Hand Lamp. Circa 1920's. At left is the "before" look. At right after cleaning and new nickel plating. This fabulous lamp is owned by Peter Brickell of Toronto. The plating was done in Canada. At left is my Veritas "The Reader." The font and gallery were in good condition and looked nice after polishing. But as found in Cornwall (on eBay) it was missing the reflector and had an incorrect chimney. I located a reflector in England, but it was brass. Still looks nice but does not match the lamp. After Dave Ward did his magic of replating it looks beautiful. The photo is dark because a flash simply reflects too much light from the beautiful replating. Far left, Miller Jr. Hand lamp. Right is a New Rochester hand lamp. The New Rochester was an obvious copy of the Miller. Miller had a copyright on the design. The New Rochester was then only sold in very limited quantity in England. I found this one with a good font but thoroughly trashed burner, split, missing chimney fingers, etc. Because of its rarity it was worth restoring. David Ward did beautiful work and got it back to useable condition again. 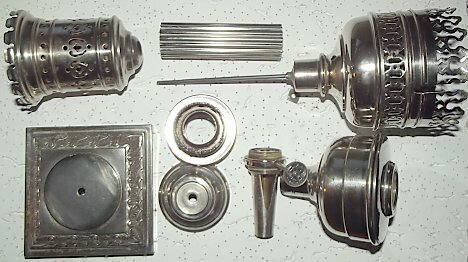 At left is a Miller Finger Lamp. 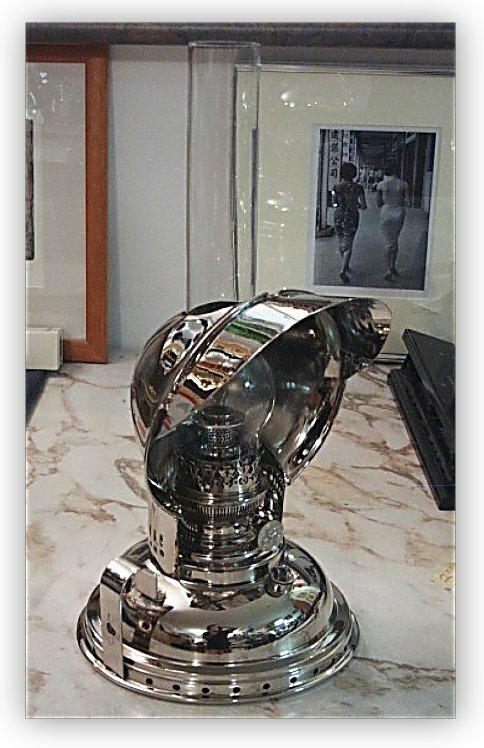 It was sent to David Ward for his wonderful polishing work. At right is a simple, plain Rochester #2 table lamp. It is one of my best burning lamps, but it was supremely ugly. 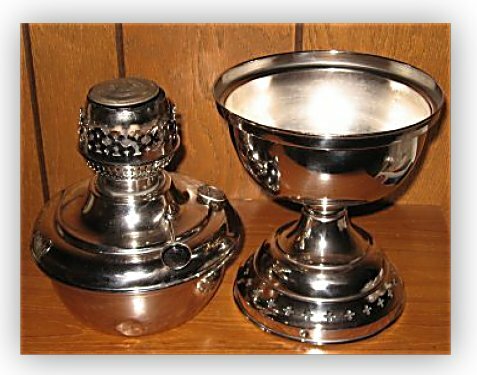 The original nickel plating was so thin it appeared the lamp was simply walked past the plating shop in a hurry. No dings, dents or flaws, just ugly. 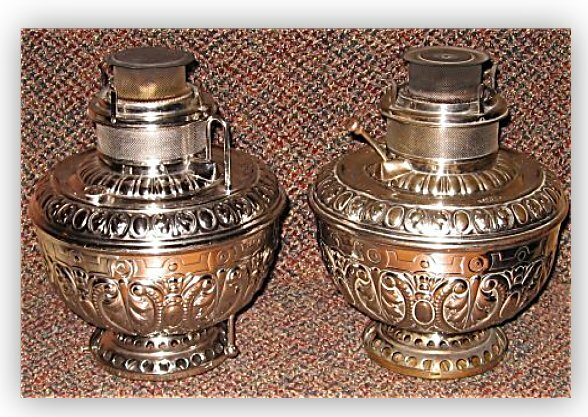 The photo at right shows the lamp after nickel plating by David Ward. It looks better than it did when new! I don't have to hide it now. At right, a "French Garden Lamp" made by Wild & Wessel. The burner is an 8'''. This lamp was designed to permit burning outdoors in a draft (Punkah top) and light up a fancy French garden. The short chimney inhibits really clean burning, but that is not a problem outdoors when burning as intended. This particular lamp was purchased on eBay.fr and arrived straight from a French garden, spider webs and dirt intact. 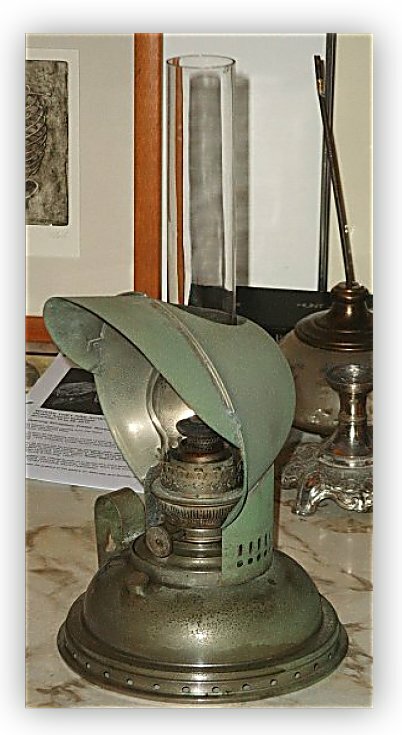 Lamp restored; parts as received, parts after citric acid bath, parts after polishing. Click the photo to enlarge the lamp. I have had my lamp restoration and replating done by The Village Lamp Shop. I am not in any way affiliated with the Village Lamp Shop. I have my work done there because they have achieved that most rare status - they have gone beyond master craftsmanship into the realm of magnificent artistry. Unfortunately, David Ward no longer does replating work and not much lamp repair. Marsha also offers Fabric Shade recovering & relining. Contact Marsha directly for more information.